We have finally reached October, my friends! October is the fallest you ever get around here. The leaves are finally actually starting to change colors, the air is cool, but not cold yet and the first of the big Holidays approaches at it’s end. October has been thoroughly taken over by Halloween in main stream culture. It’s a thing, it happens. Commercialism has stretched it out as far back as it possibly can because people will happily buy up all the jock-o-lanterns and spooky witch decorations and, of course, all the candy that is in theory for trick-or-treat, but is actually just for them to eat because it’s on sale all month, so why not? You see all over the internet people doling out lists of Halloween movies to watch all month. Most peoples October traditions are basically just a drawn out Halloween film fest. My October tradition is a little different. When I was in college I was part of a writing group, you’ve heard about them before. We called ourselves Ink as a group which transformed into Inksters for individuals. We keep in touch through a Facebook group and one friend in particular has a tradition of reading the same book this time every year. I love the idea of this tradition, but I often have trouble revisiting books over and over again. There are very few books that I have managed to do this with, given my limited attention span. I tend to get distracted by the book itself. I know what’s going to happen and I want to skip to all my favorite parts instead of just reading through and experiencing the story again. The year I got married, though, my mom-in-law gave me a complete paperback collection of Jane Austen’s novels. I had never actually read Jane Austen, though I loved her stories through the visual adaptations I had seen. At first I was just going to give them a try. Just grab one and see if I could get through it. Sometimes older writings give me trouble since they use a lot of outdated language that’s a bit hard to understand at first. This was part of my problem reading it when I was younger. So I picked a book and went with it. My first Austen was Northanger Abbey. I chose it first because it is the smallest of the novels and I felt more confident that I could get through it as opposed to, say, Emma, which goes on for ages. I’m not going to talk about Emma right now, it is too upsetting. At any rate, I did get through my first Austen quite easily and was rather pleased with it. 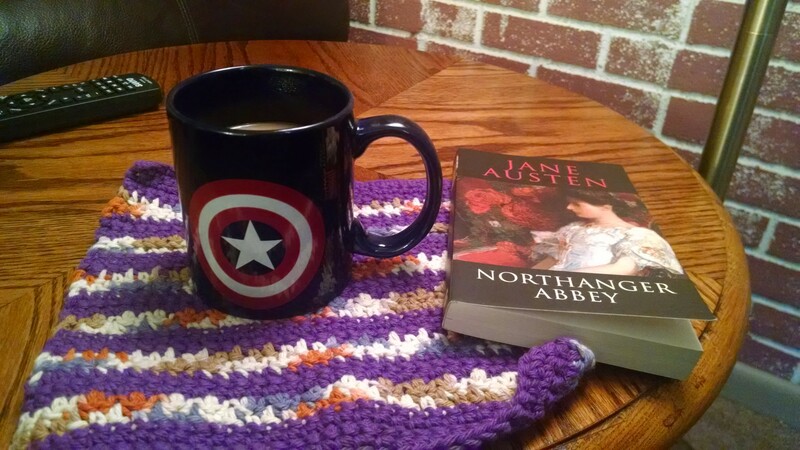 Northanger Abbey is a little creepy, but not in the way it’s intended to be, I think. Mostly it’s just the dad and the brother and that friend who’s always hitting on our heroine. Austen has a talent for creating questionable characters. My mom-in-law has a set of BBC made for TV versions from the 80s of all the Austen books. We had an Austen movie day last year sometime and watched their version of Northanger Abbey because it was short and it was terrifying. Even the love interest came off as a creep. It was thoroughly uncomfortable. But the book was enjoyable and a good start to my Austen tradition. The following year it was time for the big classic: Pride and Prejudice. I’ve watched the movie more times than I can count and even enjoyed the mini-series with my mom-in-law in one long sitting, with a break for lunch in the middle. It is easily my favorite Austen story to watch so I figured I really should read the source material at some point. I have to say, the book did not disappoint. It was, as is to be expected, better than any movie or tv version I’ve seen, though the BBC mini series with Colin Firth is a very good adaptation. I thought about going straight into Sense and Sensibility, but by then the season was over, and Austen is really best suited for fall reading. Thus the tradition has been established. Two years of reading Austen in the fall and I still have four books to go before I have to start repeating. By then I think I’ll be ready to revisit some of them. There is, however, one book which I am unwilling to read. I will put it off as long as possible and then reevaluate my stance and see if I have changed my mind in three years. I am not a fan of Emma. This is shocking to many people. All of my friends seem to be very fond of this particular book and I am not sure I see why. Like most Austen stories I know it only by way of visual media adaptations, but I have yet to see one that I really enjoyed. I’ve heard it said that she purposefully wrote the book to have no likable characters, even the protagonist. She succeeded. The love interest is the only forgivable one. I almost kind of like the dad, despite his many faults. but Emma herself is ridiculous and I want to shake her through the whole thing. I want to smack her friend for letting herself be pushed around, but its not really her fault. Emma has a very dominating presence. I want to choke the reverend and his wife especially and I just feel bad for the other characters. I’ve given Emma a fair chance, I feel, watching two different adaptations and not really caring for either. Her book is the longest of the Austen novels and I am unconvinced at this point that it is worth my fall. We shall see when I’ve gotten through the others how I feel about it. This year will be Sense and Sensibility and I’m pretty pumped. I am rather fond of the 1998 film version and even managed to find it at a Half Priced Books maga clearance sale along with the newer version of Pride and Prejudice. Or rather, I should say my mom-in-law found them. She’s got a great eye for such things. I also have a graphic novel adaptation of the book, which I look forward to skimming after I finish the original. That is how I tend to do graphic novel adaptations of my favorite books. I just like to look at the pictures and see how they portrayed the scenes that were until then only in my head. I recently found The Graveyard Book by Neil Gaiman in graphic novel form, vol. 1, and was very pleased to buy it. But I’ve gone off on a bunny trail again. 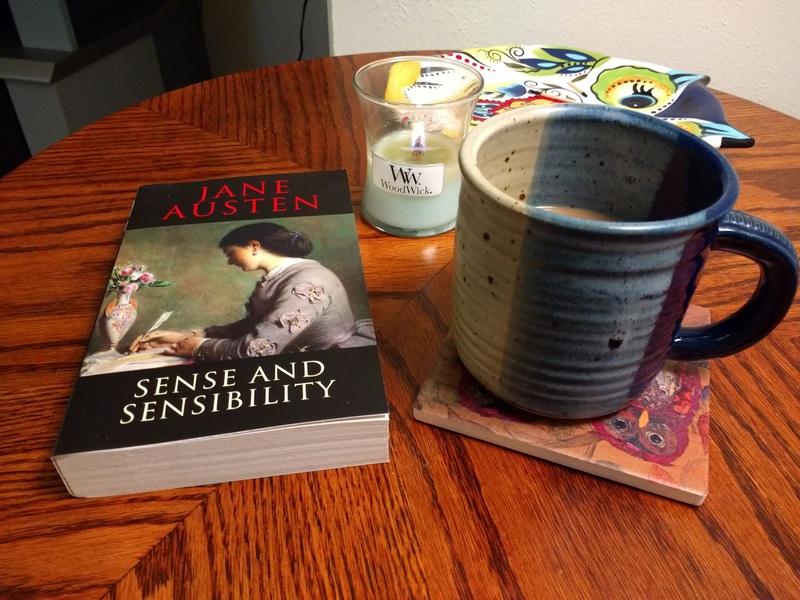 I was a little wary of Sense and Sensibility because it too is filled with several characters I would like to shake, but the good outweighs the frustration and all Austen novels have a little bit of that, so I think I can handle it. I hope you, too, have a good book to read this fine fall season, and I hope you have a lovely day, my friends.